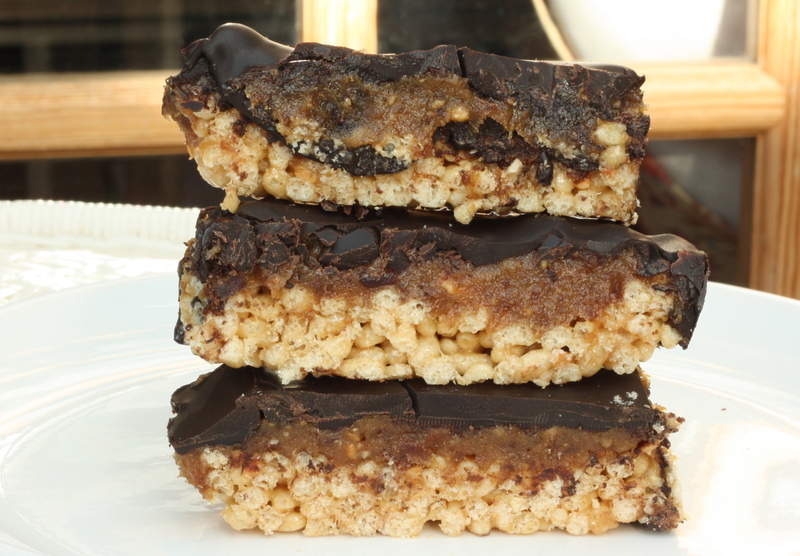 First of all, these To Die For Gluten Free Twix Bars are amazingly healthier and better than the original! Really!!! Because they are made from dates and do not contain processed sugar, you can feel a little less guilty about eating them. As a result, I can say from experience…I am a huge fan of the Twix chocolate bar. But when my vegan friend brought these into work, I fell in love with a healthier version of my favourite chocolate treatDon’t get me wrong, they still pack a bit of a calorific punch, however everyone is allowed to indulge every once in a while right? This is easy to make vegan or dairy free. Instead of using conventional chocolate, simply use dairy free chocolate and you’ve got a dairy free, gluten free snack. Hence, this is an ideal recipe that anyone can enjoy. With parchment paper, line a 9″ x 11″ baking pan. Set aside. Firstly, on medium heat, melt together rice syrup, peanut butter and vanilla. Once melted and starts to bubble, remove from heat. Next, add a pinch of sea salt (optional). Mix well. In a separate bowl, add gluten free rice krispies and carefully pour over the hot peanut butter mixture. Mix well. Because the mixture will be quite sticky, pour into a pan and press into the baking pan with wet hands. Finally, pop the dish into the freezer for 10 minutes or so to set. 2 1/2 Cups Soft and Pitted Medjool Dates (if too dry, soak in hot water for a few minutes and drain well). In a food processor, add pitted dates, peanut butter, almond butter and salt. Blitz until smooth and a thick consistency. If the mixture is too thick and not blending well, add a bit more almond milk if needed. The amount will depend on how moist the dates are and how well your food processor works. Next, remove rice krispie base from freeze and spread evenly across the top. Place back into freezer and start on your chocolate sauce. On medium heat, melt chocolate and coconut oil together until smooth. Pour and evenly spread over date and rice krispie mixture. Place back into fridge or freezer and allow to partially set. Most importantly, the trick is to allow the chocolate to set, just until it is soft but not too runny. It’s at this point you will cut the bars into strips or squares. If you allow the chocolate to set entirely, it will become hard and crack when cut. Cutting it in the middle of the cooling process will give you nice, smooth lines and a clean cut. Finally, cut into bars or squares and return to the freezer or fridge until ready to eat. But most importantly, remember to share!!! !